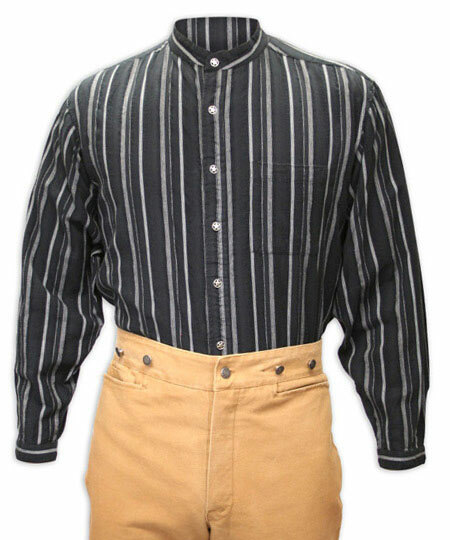 We have sold hundreds of rangewear western shirts, and we listen closely to customer feedback to make sure we're delivering on the promise of unique, authentic clothing, world class service, and great prices. 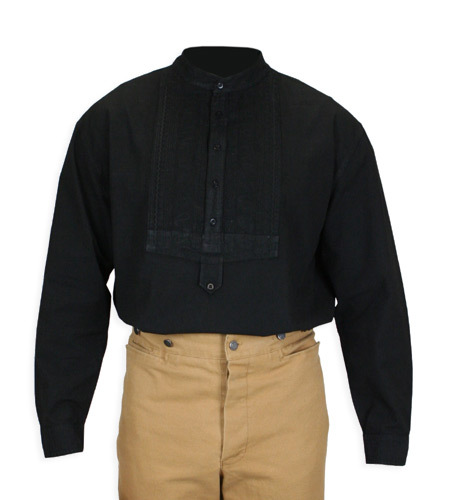 We survey every customer to gauge their opinion of the products they bought, and put together this list of the top-ranked rangewear western shirts in our store. 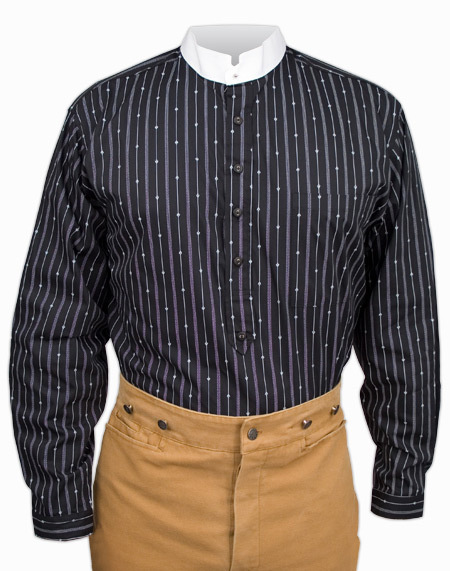 Shop with confidence, knowing that these terrific rangewear western shirts have been tested and endorsed by our other customers, and that you will receive five star service along with a great value! This shirt is built from what feels to be some sturdy material. I expect that I will be able to get moderate use from this shirt over several years. If I am wrong about this shirt and it does not hold up to moderate use, I will be back to update this review. This is a top quality shirt and the fit is great. I plan on purchasing more of them. It is a very comfortable shirt to wear. 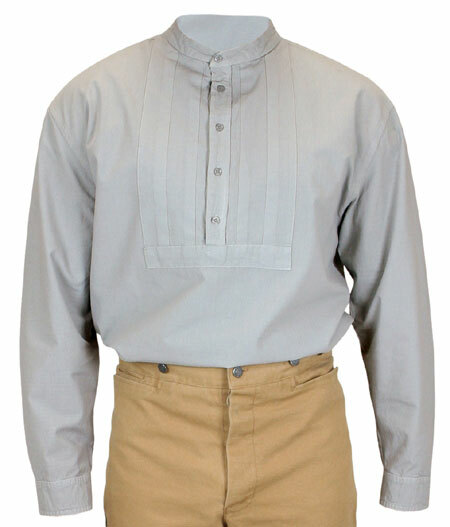 They may call it a work shirt, but it looks good enough for leisure wear as well. The fabric seems to be sturdy and durable enough to qualify as a work shirt. It will receive a bit of rough wear over the next few months, and I anticipate it will retain its good looks. Perfect colour and nice fit. 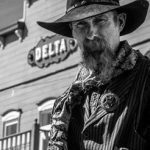 OK, so I am new to Cowboy Action Shooting, and dressing the part. The thing is, I,m not really a great shot, SLOW, but DAM, do I look good in this shirt, and it,s always MIND OVER MATTER, I don't mind being slow, and it just dosent matter. Great product, great fit, thanks so much. BUTCHER CREEK BOB. Excellent quality, design, buttons; and really comfortable fabric to wear. Two thumbs WAY Up! Another great looking and great fitting shirt. Love the tin star buttons, a nice touch! Came on a hanger and protected by a garment bag. The shirt maintained it's fit after the first wash, per instructions. I can see this becoming my favorite shirt! Shipping and customer service are top-drawer. I'll be coming back! The shirt was of higher quality than I expected. Very well made and very comfortable! My husband has always loved wild west styles, and as close as he would come to actually buying any is a new pair of Levi's 501s! So I was thrilled to discover Historical Emporium, and all the eras that you cover with your clothing. I got him the Gardner Work Shirt, guessed at the size, and he loved it so much he immediately tore off the shirt he was wearing to show me how fine he looked in the new one. Fantastic service, too. I'll be back for more! this shirt is so comfortable soft and true to fit! I see more of them in my future! I measured my neck at 17.5” and ordered the XL. I found the actual neck measurement when it arrived to be over 18.5”. I contacted historicalemporium and they actually measured a large for me and were very helpful in the exchange process. I recommend measuring the neck and shoulder width of a shirt you own and asking them to take the same measurements on the shirt you want to order. 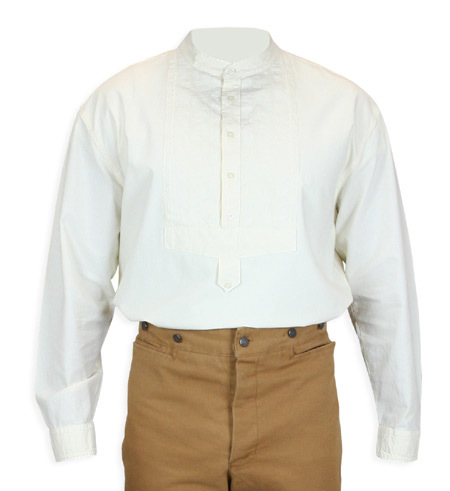 I love the style of this shirt; the side-button flap has a little bit of a bib front feel without looking full-on Cavalry, and the material is a rough-hewn natural feel that can be casual or dressed up a bit with a vest. Sizing was difficult for me because I have dress shirts in neck sizes from 17.5-18.5 and so I bought the XL. It was too big; because the cut in the body was larger the sleeves fell further down my shoulders. I bought the L and it fit perfectly. The sleeve length is the same for both sizes, so I ended up buying both to try them on side by side. Runs true to size and looks great! I just love this shirt! When I saw it I knew that I had to have it! It looks great on! Really good quality. Exactly what I wanted. It was on the large side for a size "L", so I have returned it for a size "M". So far the exchange process has been smooth. Just waiting to get the new one. We love it, it fits very well and is the look we were striving for as my Groom! This shirt is of high quality fabric. The fit was true to size and looks sharp. Comfortable fit. And nicely unusual. I have this shirt in ivory and black. I never fail to get multiple compliments when i wear one of them. Great feel and texture. Dress up or down. Looks great. I am pleased. We bought this shirt and the walnut duster. The two of them go together very well. Both are comfortable enough to wear all day. The stitching is well done. No flaws, no shortcuts. The sizing is a bit big but I much prefer that to too small. This shirt feels authentic. It's also well enough made and comfortable enough to wear anywhere. We are pleased with the purchase. Fits. Good material. Good stitching. Well made shirt. Comfortable and looks good. Fits the period. Teamed with the walnut canvas duster and a derby, everything comes together and it's all comfortable. It needs boots and something other than jeans for the pants but I had those already. It's good to have a costume that looks right and is comfortable enough to wear all day. I love this shirt and everything about it but again where are they getting the sizing from? I wear a XXL in EVERYTHING! but when I got this it is closer to a XXXXL. I had to get the shirt taylored to fit me. Looks very sturdy. Nice old-timey feel to it. Kudos to Meaghan for correcting my first order and rapidly sending my re-order! Good [product, great service! Thanks! Looks sharp, well made and even my wife likes it. I love this shirt so much that I ordered one in every colour after getting the first. The thick soft cotton washes well, with little need for ironing, and it is beautiful and so comfortable. The colour is more of a warm vanilla shade than "white". I get compliments just about every time I wear it! It's not white like it shows on the image, I should have known that Ivory isn't white so it's really my fault. An expensive fault too, I'm from England! I originally purchased this shirt in black. From the moment I put the shirt on, I liked it. Comfortable, a slightly heavier fabric, but a loose, cool fit. I liked it so much that I began wearing it about town now and then. Living in "the last best place (Montana)," this shirt fits right in.I received so many complimentary comments that I ordered it in ivory and burgundy. It may be a "period" shirt, but is truly timeless. Well constructed, nice details, and comfort galore. I am very pleased with the shirt, as it was all it claimed to be, and even nicer. Service was excellent, timely, everything I could ask for. It fits perfectly with my needs for one of various historical musical "re-enactments" I do. Service and quality were so good, I ordered more "product" from you. Excellent quality and well made! I like the shirt and the quality, I find that H E makes good quality shirts, worth the money. I was very disappointed tot see that this one was made in China. Seriously? China. I like to support small, local companies that make stuff in the US and support local workers, but this seems to no longer apply to you. If you moved to China why didn't the price of the shirt come down? Not happy. Editor's Note - Several years ago, the manufacturer switched to overseas production. The product description has been updated to make this clear. This shirt just blows me away! Superb quality, fit and styling. It's very unusual to wear this style these days, but I personally love it. It looks great with all my waistcoats (also purchased here) and turns heads wherever I go. 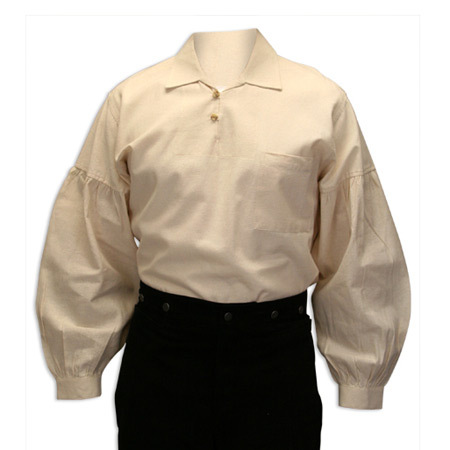 Thank you, Historical Emporium, for offering such fine garments, and keeping Victorian-era style alive and well! This is the fourth shirt I've purchased. The quality is outstanding! A beautiful, unique, classy shirt. Nice job as always! This is a nice looking shirt & I'm looking forward to wearing it when the time arrives. Glad to have found a larger size as well. the shirt is extremely comfortable and fits beautifully. the shirt appears to be well made. I like the style very much and would not hesitate to purchase others of this style. You can not go wrong with this shirt. Clothing from Gentlemen's Emporium has been chosen as the staple of my everyday wear and this quality shirt with a stunning look is one of my favorites. This opinion is not just mine, the Earp shirt brings in great comments from a lot of people. Because the shirt has the band style collar with a top fastening stud, the four available collars can be used with the shirt providing a wide range of looks. The fit is perfect, the craftsmanship top notch, making this a value buy. Bought this for SASS events but this shirt could easily be used for a night on the town. Well made. I am very impressed with the fit and finish of this shirt. The fabric is very sturdy, and the fit is very roomy. Highly recommended! Once again the sizes are dead on and material is one of the most comfortable to wear. Giving a crisp look but soft against the skin. breathable fabric is never hot and that is a plus in Florida. Beautiful print makes this a keeper for casual and dress alike. The shirt is very well made and I like the heavy cotton fabric. The extra full cut is a bit different from modern fit, but is period appropriate. The one feature I’m not fond of is the extended shirt tail in the back. I didn’t see this in the posted photos and would have preferred a square cut bottom. I bought this to make a Santa work shirt out of. 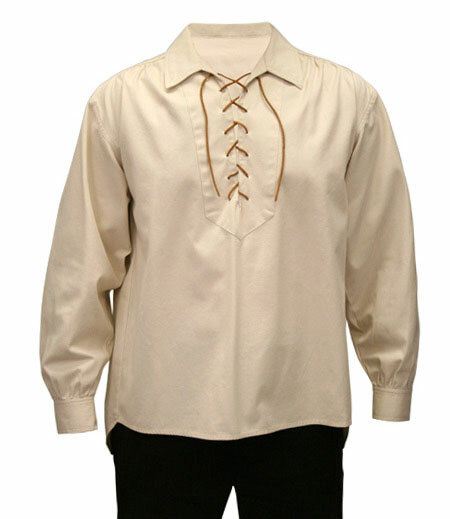 I changed the leather lace to a green ribbon and it works great plus it is a great feeling shirt. To start I wear this shirt as everyday wear. It looks wonderful as a stand apart from the crowd shirt and I have turned heads every time I go out. 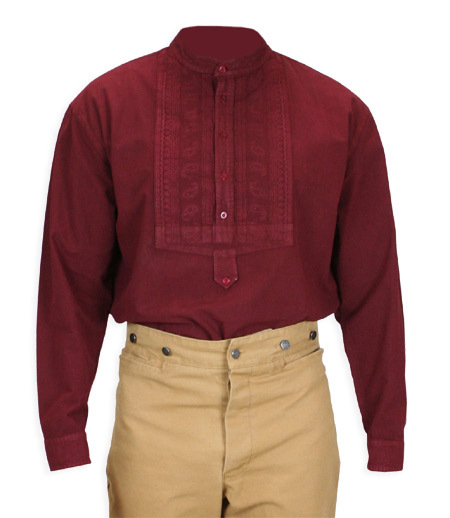 I am also using it for my voyager outfit for my Northwest Company recreations. I will send a photo as soon as I can. The shirt is made from a heavier canvas material so it is hard wearing in my opinion. This is not a prop or a cheap shirt. It is well made and will stand up to the rigors of everyday life not just for special occasions. the opening on the front goes halfway down my torso. At first i thought this was too large but it is the wow factor of the shirt. Make a note though take out the lacing when washing!! Also make note of how to lace it up as I made several mistakes the first time. 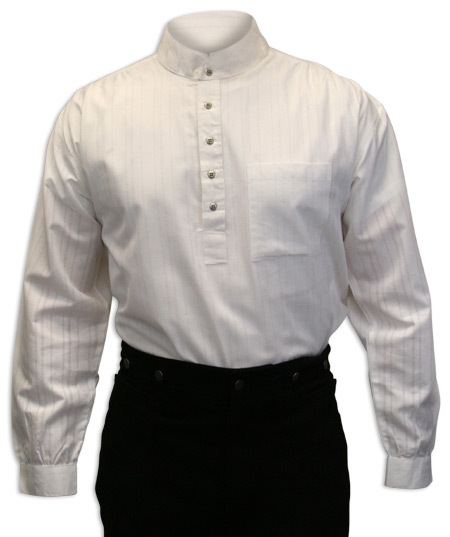 The skinner work shirt is of excellent quality and fits true to size. I like the heavier weight fabric. Will hold up for years of use. Love it!! Much better than I expected!! Loved the service. It would have been nice if the front of the shirt was as long as the back of the shirt. This is a great shirt ! I had a hard time finding a shirt like this. Is is a great quality. A leetle hard to iron, but that was to be expected :) . First time I wore it , I got many compliments on it. I would buy another one, but there arnt a a lot of colors to choose from. You cann't go wrong buying one of these if you like this style. As in, "This is EXACTLY what I was looking for!" Workmanship is awesome, shirt is heavy-weight fabric, made to last. I perform re-enactments six days a week all summer long, so most 'costume grade' costuming just doesn't cut it. These have the look and feel I wanted, and should last quite a while. Thanks H.E.!!! Fantastic shirt.!! Very well made. I love it. Mighty handsome shirt. I recommend this shirt highly. Very satisfied with it. No complaints. I just placed an order for another one. Good quality shirt. Very authentic. I took your advise pr. email about size, and my Skinner Work Shirt came perfect, very nice, thank you ! I wear these clothes every day, and this is a new favorite. The weather is getting warm, and the material is rather heavy so we shall see. Perfect fit for the size, and very comfortable. All in all this is the level of quality I expect from The Emporium! Another great purchase from the historical emporium. The fit works very well with my frame, and I have received numerous compliments. It would be nice if the manufacturer could release this style in more colors. A great shirt in look at feel! It's well made and the design is unique. Quality products and smooth transaction. This shirt is twice as nice as I expected. Wore it while traveling for comfort, but received so many compliments I decided to wear it in more formal meetings. It was well received. Comfortable, well built, a great look. I give this shirt an A+! fast delivery, very satisfied with the quality and workmanship of my holster. Had to return my first one because i ordered a size to big. Returned no problem, very quick credit to my account, no hassle even though it was my mistake. My reorder was delivered with out a problem and fits much better. All the items arrived very quickly!